TapouT, it's not just for rear-window decals or bouncer neck tattoos anymore. The MMA apparel brand is releasing a line of Tekken 6 themed shirts, which will also be available as in-game customizations. The arrangement, announced at Comic-Con 2009 on Thursday, will produce five co-branded shirts IRL and in the game. 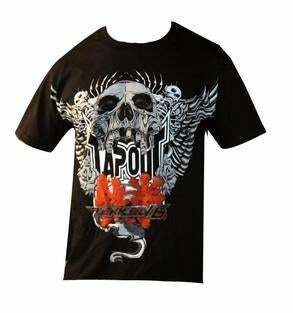 The shirts will be released in September, wherever you can buy TapouT stuff, or online at its website. It's the first co-branding agreement between Namco Bandai and a major apparel company, or so we are told.